Imagine walking through green countryside full of vineyards, olive trees, rivers and forests, full of beautiful villages and medieval towns situated on hills. Indeed it sounds like a dream. This dream can come true! Join us on a walking adventure through green Istria. Learn about the natural beauty that will open before you every step of the way and with every new winding of the road. Learn about the culture and heritage of Istria and visit picturesque towns on the hills with unforgettable views which will leave you breathless. 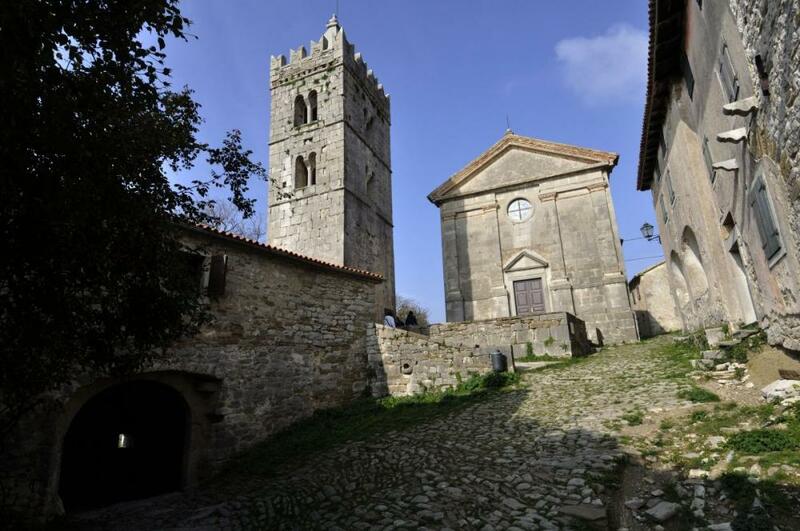 Visit Hum, the smallest town in the world and experience the spirit of the past in Motovun and Grožnjan, the town of artists. 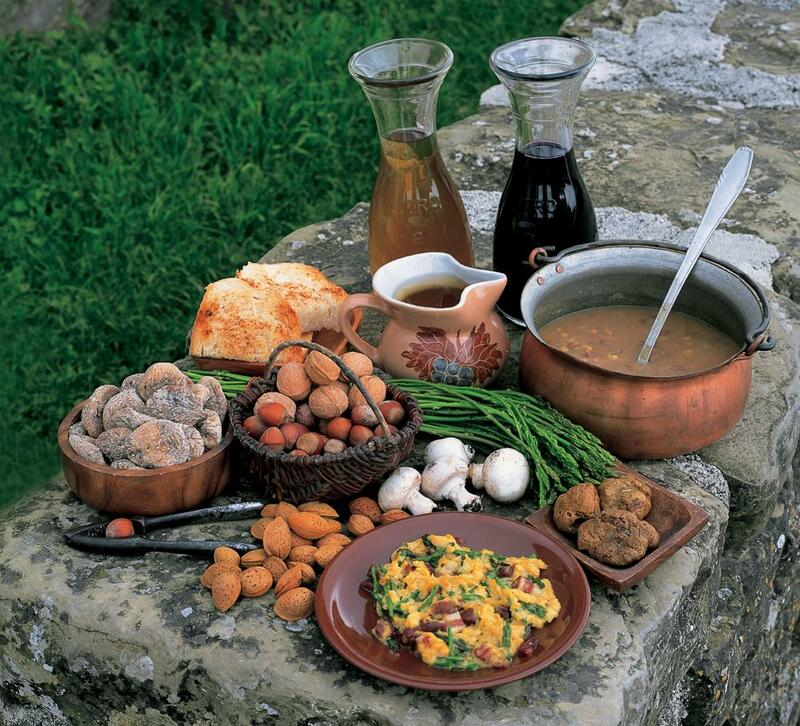 To get to know the best of Istria, walk through Učka Nature Park which contains a wealth of life and finally, round off this green adventure with the delicious flavors of indigenous Istrian delicacies and wines. Arrival in Istria. Info meeting with a representative of ours at 7pm at the hotel reception area where we will provide you with the package including hotel vouchers, maps and a road book, luggage tags. Overnight in Buje area. Short transfer to Brtonigla. The numerous acres of vineyards and olive groves are surrounded by pathways that lead towards meadows and woods, deep into the center of vibrating nature that lives intact, far away from the modern civilization. It is also a place where you can find superior wines and olive oils - many family cellars and tasting premises invite the travelers to discover the authentic power of the local lifestyle. After 3 hours walking through vineyards we reach Buje, a small hilltop town. 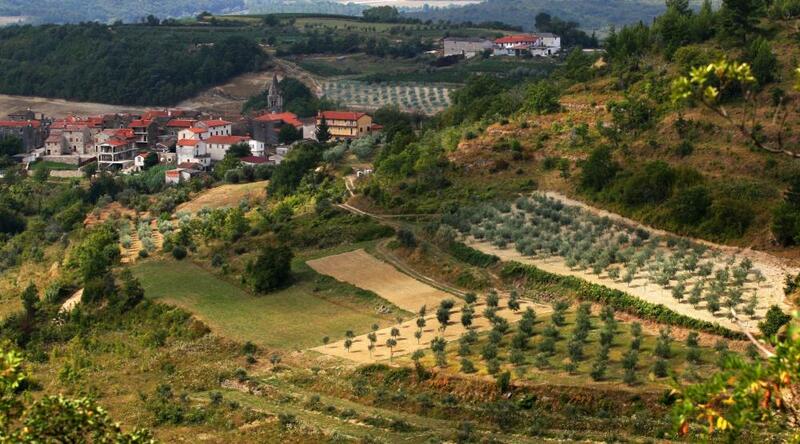 From the top of the hill you can enjoy the pretty view of terraced fields and arable land, vineyards and olive groves. Enjoy sightseeing in this town full of history and culture. Тhe route finishes in front of your hotel where you will get by ex old railway. Overnight in Buje area. Walking distance: 15 km / 10 miles. Time: 4-5 hours. Ascent: 323m. Descent: -313m. After breakfast you are ready to start exploring Istrian villages and hidden paths. After 10 minute transfer walking stage starts on ex-railway Parenzana. Parenzana was a narrow-gauge Austrian railway connecting Trieste with Poreč through a series of Istrian small towns through 123 kilometers. The railway was functioning from 1902 until 1935, and today the track has been rearranged for cycling and hiking paths wounding through Istrian hills. Grožnjan will be your starting point. After you saw It's galleries and viewpoints you can pass through magnificent rolling landscapes and lively Istrian vineyards. After passing through several tunnels, over old bridges you can stop by many fascinating view point before reaching the village of Livade - the truffle center of the world where you can taste and buy some products with truffles. In front of Livade on a hill is located the town of Motovun. Overnight in Motovun. Walking distance: 26 km / 16 miles. Time: 7-8 hours.Ascent: 455m. Descent: 478m. Ater breakfast short transfer to Oprtalj. Picturesque little town deeply in the Istrian peninsula, where the Istrian Mountain Trail starts. The route goes downhill into the forest and passes Sv. Ivan (st.John) village. The next village is st. Lucija with a very beautiful church. After passing by a few villages you will get to Control point - one of the best views points over Mirna river and its valley. The trail passes by the Pietrapelosa castle and leads down the valley. After passing by an aqueduct the trail goes up the hill towards the village of Mali Mlun and after passing a few more villages, it opens a beautiful view to the town of Buzet. Through forests and fields the trail will get you to Buzet. Overnight in Buzet. Hiking distance: 19 km / 11 miles. Time: 5-6 hours. Ascent: 622m. Descent: 866m. Alternative shorter walk is available at approximately 8 km / 5 miles, taking 2-3 hours. The path from Buzet to Hum can be a circular trail or one way if you start from Hum. The trail starts by the river and turns into the forest, passing over shallow river or riverbed if it's dry. It's passing by some waterfalls with lakes. Nice and not too steep, the trail leads you all the way to Kotli, the water springs with natural pools and an old watermill. 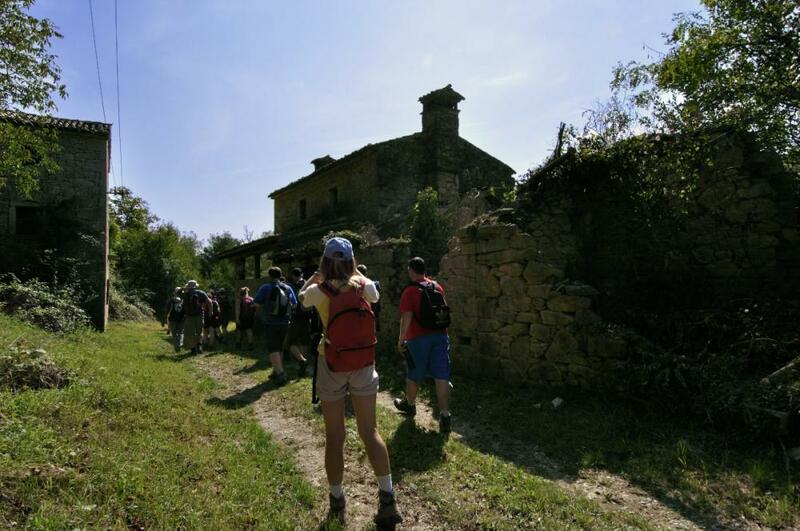 The trail continues following the riverbed and passes trough Benčići, an abandoned village where you can see traditional Istrian stone houses. From there you can see Hum and it's recognizable church tower in the distance. When you get to Hum, take a walk and you'll understand why it is the smallest town in the world. In Hum you can eat at the local "konoba", a word form the local dialect that means restaurant. 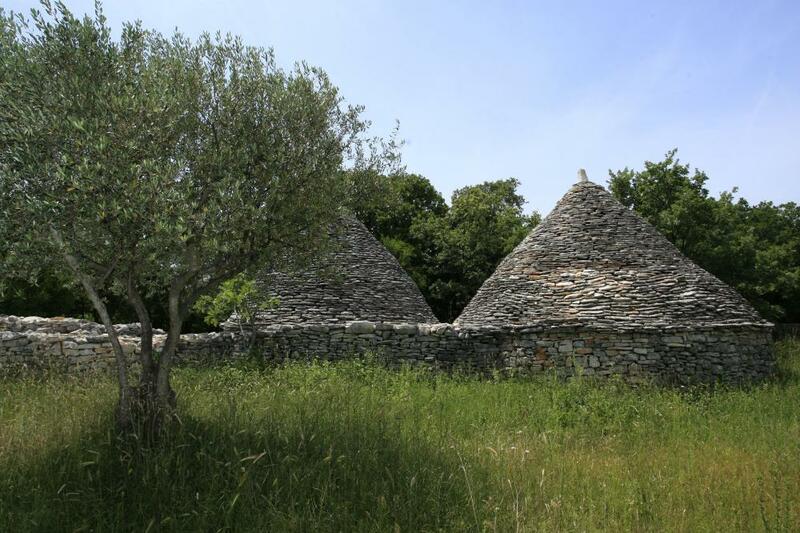 The "konoba" in Hum offers you nothing but traditional istrian dishes. The «way of mistletoe» will lead you all the way back to Buzet. It takes about 3 hours of hiking one way. Overnight in Buzet. Walking distance: 26km/16 miles. Time: 7-8 hours. Ascent: 534m. Descent: 534m. Alternative shorter walk is available at approximately 14 km / 8 miles. Time: 3-4 hours. Transfer to Poklon,a saddle between two hills where the trail starts. It goes onto the top of Učka mountain which is the biggest mountain in Istria with altitude of 1401 m. From the top it goes all the way down on sea level in Lovran. The path is covered by oak and chestnut forests that give pleasant freshness in hot summers. The very summit of Ucka (Vojak) is worth to climb on for the stunning panorama. The panorama of Kvarner bay is over sea and coastal towns, as well as the mountains in the background: Obruc, Snjeznik and Risnjak Western side - the whole Istrian peninsula lies in front of you. Sometimes, if visibility is good, there is a view towards Venice and to the Alps on the northern side. Overnight in Lovran. Walking distance: 12 km / 7 miles. Time: 5-6 hours. Ascent: 452m. Descent: 1400m. Alternative shorter walk is available at Ascent: 90m. Descent: 390m. Distance 6 km / 4 miles. Time: 2 hours.